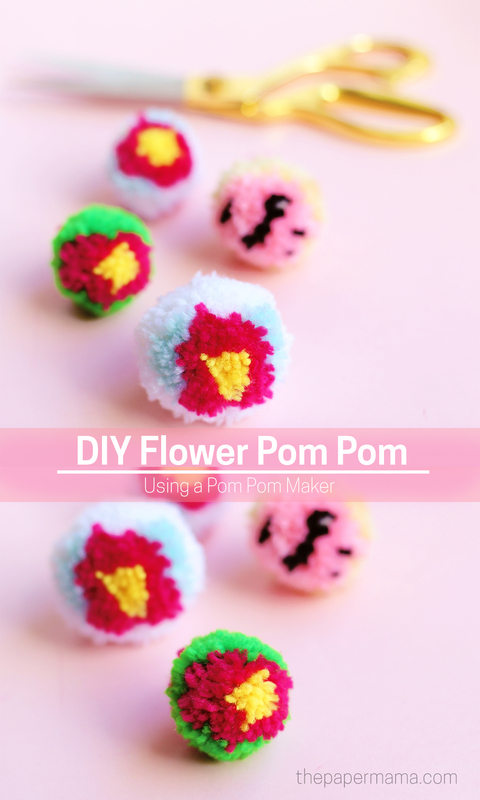 DIY Flower Pom Pom - Using a Pom Pom Maker!!! On one side of the pom maker wrap some yellow yarn around one of the paired arches.. Knot the yarn on the inner circle when done wrapping. Wrap the pink yarn around the whole arch, twice. Knot the yarn on the inner circle when done wrapping. Wrap the green yarn around the whole arch, twice. Knot the yarn on the inner circle when done wrapping. Repeat steps 1 and 2 on the other arch and fold the arches closed together. Cut a bit of yarn to tie up your pom with. Just make sure it’s long enough to wrap around the center and tie with. 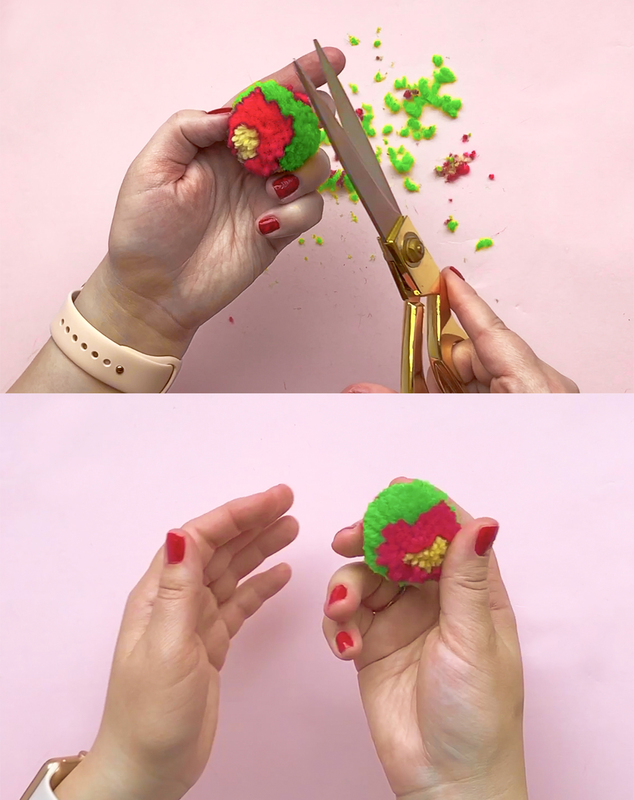 Securely hold the wrapped up pom maker closed and cut down the center to reveal your pretty design! 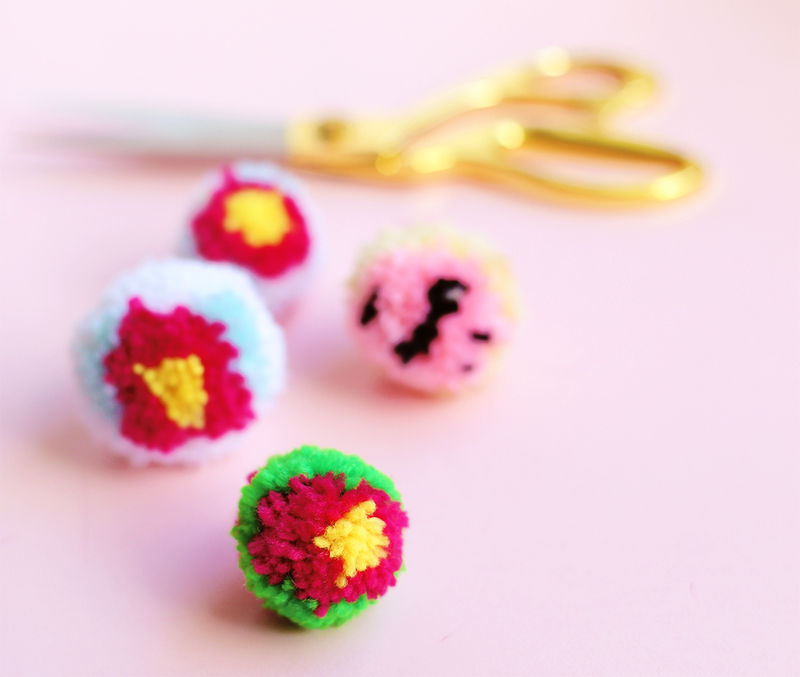 *These pom makers do like to pop open before you can tie them, so hold on tight! 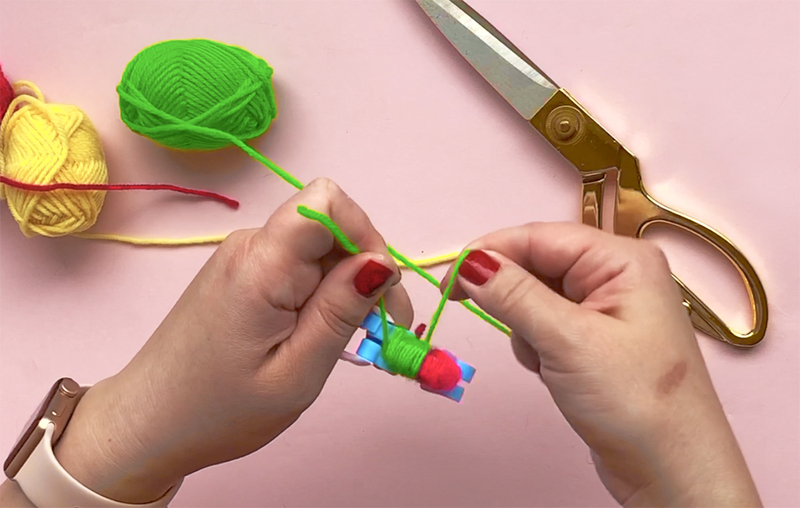 Wrap your cut bit of yarn down the center of the pom maker and tie. I like to wrap it twice for some extra security. 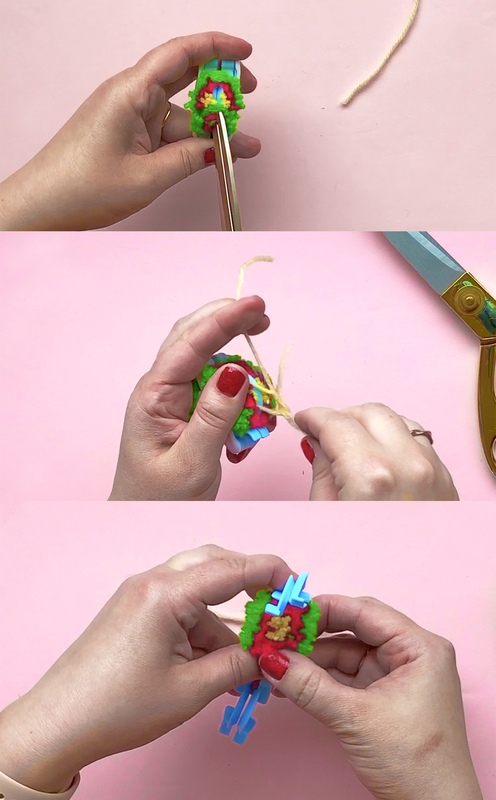 Release the pom arches and pull apart the pom maker! There’s your pom! Your pom will need a bit of a haircut at this point. Fluff the pom a bit with your fingers and trim it up… and now you are done! Use these poms for some amazing home decor project, or maybe some lovely jewelry? If you’d like to see me make these pom poms you can check out my video tutorial below, or over on YouTube. 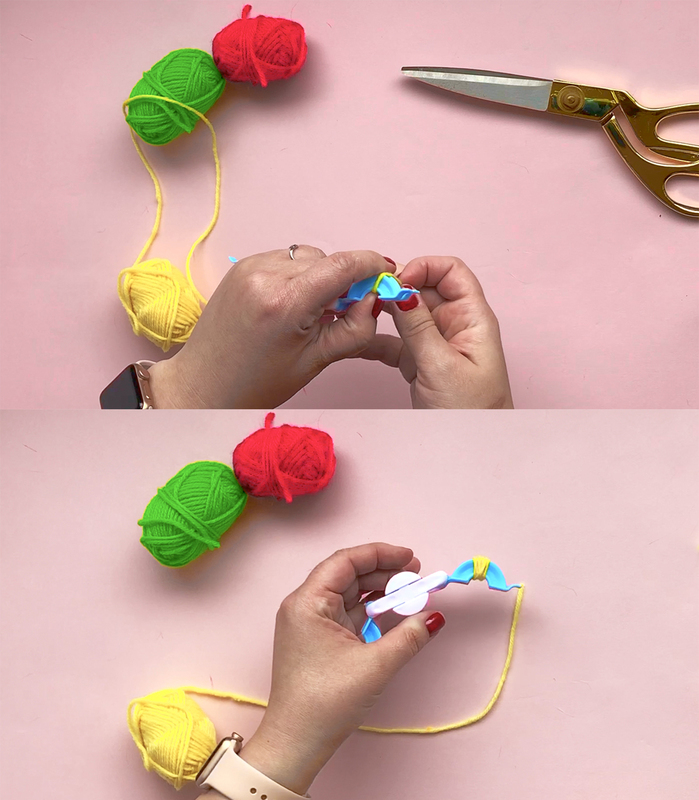 Do you want to get started making your own pom poms? Yes? This giveaway is just for you. My sweet friend, Rachel from The Crafted Life, just published her first book and it’s LOVELY. 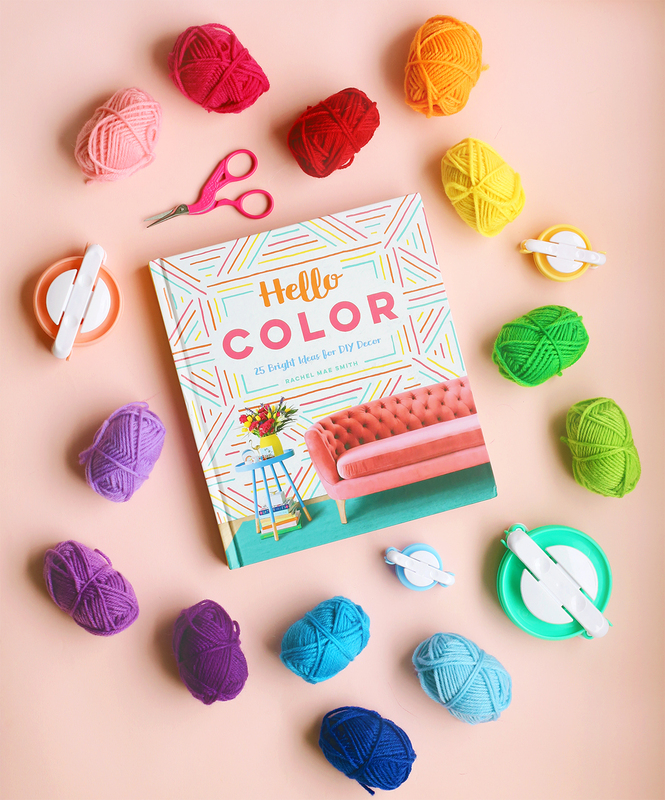 The Hello Color book is full of colorful and clever DIY’s and it is also a pretty book to set on your coffee table. Look at it! So cute. 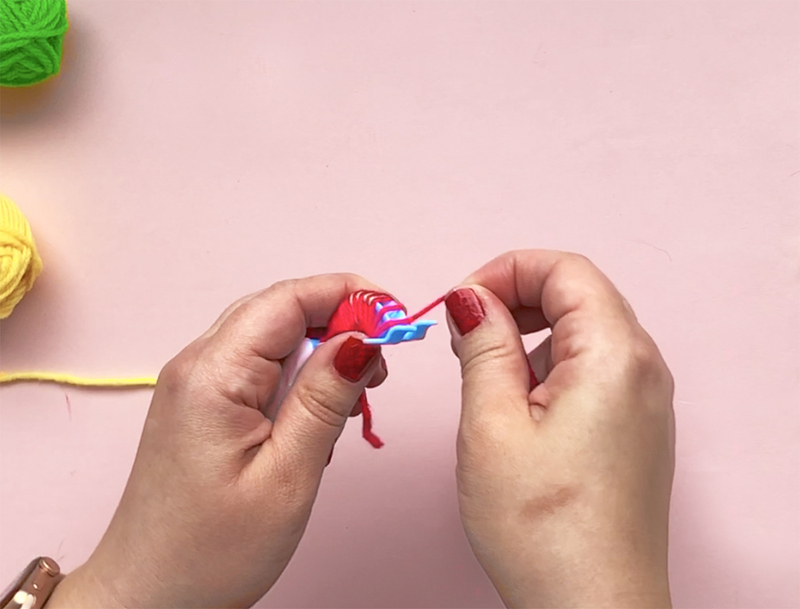 Your very own copy of Hello Color, a pack of 16 colorful mini skeins of yarn (22 yards each), a pack of your very own pom pom makers, and a super cute pair of neon pink bird scissors. With this kit you can jump right in to making all the pom poms. I made pom-poms many years ago, but not with a special tool. I’ve been thinking about getting some pompom makers forever. They’re so much easier to work with than the cardboard circles I use! I’ve tried to make them without one of those fancy pompom makers and it didn’t work out so well. ? Need to try it again with one of those! I’ve tried with a fork and cardboard. These are SO much easier. I can’t stop making pom poms!